This system came about over the course of a year. It is very much flavoured by my creative decisions and patching- style. It has a lot of foundational modular building blocks because I like patching complexity from simple tools. I really hope some other people can get some enjoyment out of this system and I do feel it is open ended enough to light up people's creativity. Amazing work -- many thanks! I've been kind of wondering whether to get back into Pd, and this will give me an incentive. I was never anything like a power user, though I wrote an article or two about Pd for Electronic Musician, gee, it must be close to ten years ago now. What's remarkable about xodular, quite aside from the excellent variety of preconfigured modules, is that the darn thing runs properly, right from the get-go. I double-click on the file, start the DSP, hook up a couple of patch cords, and it just works, no muss or fuss. Thanks for the appreciation, guys! Yes, midiguru, I'm very happy you say that it works straight out of the box. 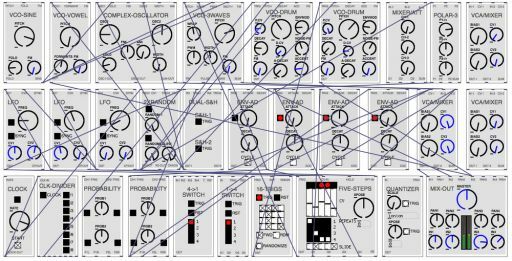 I always aimed for the experience to be as similar as possible to patching on a hardware modular. So super cool, downloaded , thanks a lot for the effort. this is really great and ive had a lot of fun with it so far! thank you for sharing it for free!! Thanks guys! Here's a video of me performing a piece with XODULAR and an OP-1. Hello I have to upload at least to posts to be allowed to post pictures which is necessary for me to explain the problem I'm having with the Xodular. Sorry for the spam! Hello. 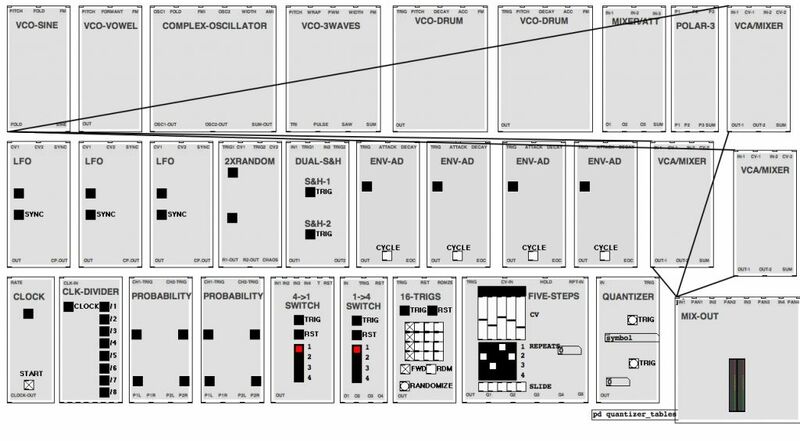 The Xodular seems like a really cool virtual modular system and I really want to try it. The problem is it looks like this when I'm opening it. Any ideas what to do? Your help is much appreciated! looks like the one thats missing is the knob - i'm not sure thats a vanilla pd object, have you got pd-extended installed? Needing pd-extended would be a good guess. Also, just in case the information turns out to be relevant -- what computer OS are you on? I have tried running it with the latest version of pd extended, still looks like this. no knobs to turn. Maybe I have to do something else? Have you asked on the pd users' forum? Someone there is more likely to know the answer, as this sounds like a pd problem, not a Xodular problem. i have the (almost) the same thing as asynkron.. no knobs on my "real" pc, no knobs on linux, but on the win7 krapptop it's ok... so it's kinda workaround.. i'm not an expert in PD at all.. and yeah, i have pd-extended..
would this system work on a bela beaglebone platform? People with no knobs (ha) do you definitely have the flatgui external installed? Go to the PD help browser and see if its in there. If it is try opening flatgui/knob-help.pd do the knobs appear in the help file? this is really fun to use, great work! This is awesome. I've worked with MAXMSP a bit, but have been meaning to get into Pd. This is excellent motivation and a great instrument.